This is seriously one of the easiest and tastiest salmon recipes we’ve ever made. Adapted for two from the excellent Good Fish: Sustainable Seafood Recipes from the Pacific Coast by Becky Selengut (from whom I received a private cooking lesson, jealous much? 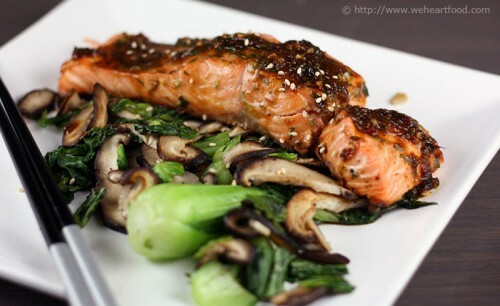 ), salmon fillets marinate in sake and mirin before being steamed along with mushrooms and onions. The marinade is reduced to make an addictive, aromatic sauce. 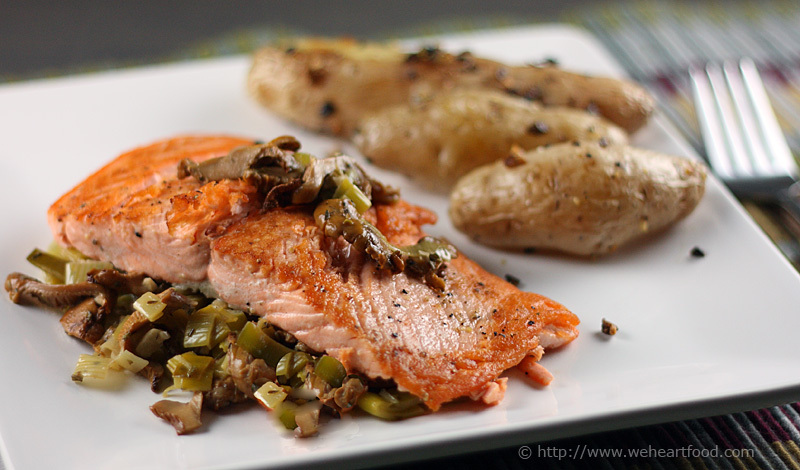 We served the salmon with some roasted fingerling potatoes. Highly recommended! I wonder if people think we just don’t cook anymore? Totally! I’m so glad I picked up this book — all the recipes look fantastic. 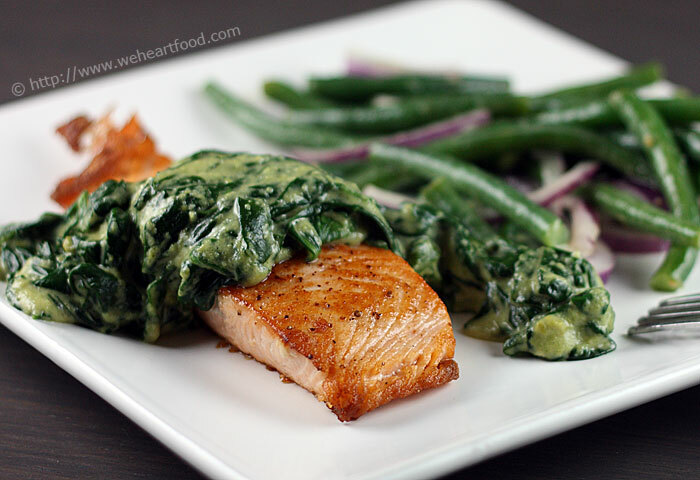 This salmon is awesome. I love the sauce on top. And hooray for mushrooms! I love recipes that look fancy but are super-simple like this. I guess the hardest thing was finding the banana leaves — which smelled really good while this was steaming, by the way. Yeah and that wasn’t even that hard — hooray for HT Market! By the way, it was total torture that the house smelled so good while I was stuck upstairs putting Cason to bed. In shallow glass dish, combine the sake, mirin, soy sauce, ginger, lime juice, and salt. Add the salmon and marinate for about 30 minutes. 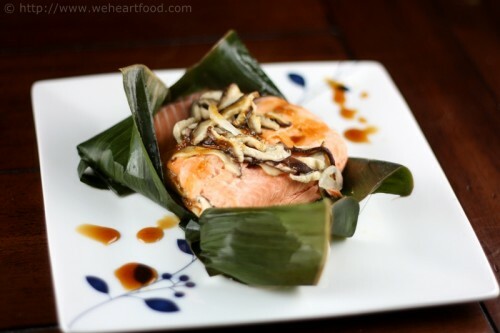 Lay the banana leaves out and place half the mushrooms and onions on each. 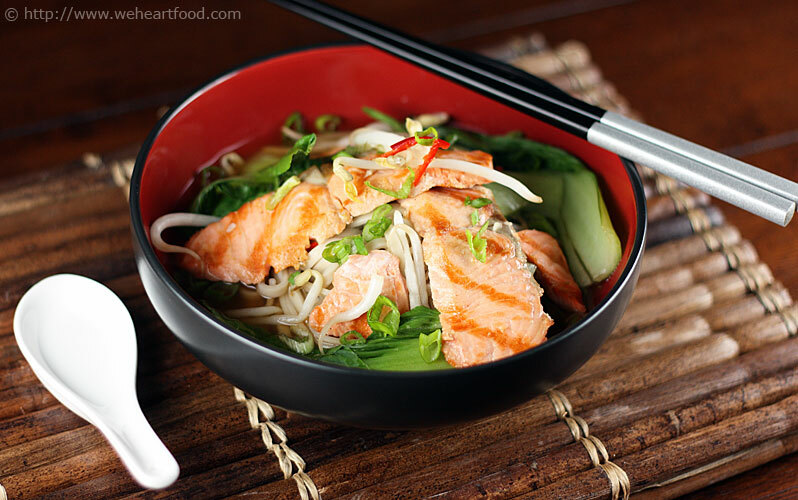 Top with a piece of salmon, reserving the marinade. Top each salmon piece with a tsp of butter. Fold the sides of the leaves over the fish and then tuck under the top and bottom to make a packet. Place the two packets into a steamer basket. In a medium saucepan over high heat, add 2 cups water; when it boils, reduce the heat to a simmer, place the steamer basket into the pan and cover. Cook for about 8 minutes per inch of thickness. Meanwhile, add the marinade to a small saucepan over high heat and reduce until it gets syrupy, about 10-15 minutes. Remove the salmon packets from the steamer basket and let them rest for a few minutes. Check for the level of doneness you like. Open each packet and top with some of the sauce.